Free delivery on all orders, how wonderful! Offer: Free Next Day Delivery on all orders. T&C’s: No exclusions. Cannot be used with any other discount. Discount will be applied at checkout. Santa and his elves on their way. Surprise the children on Christmas morning with one of our fantastic playhouses, we are offering the following discount. T&C’s: Offer only available on Playhouses; Full priced items only; Cannot be used with any other discount codes; Must be redeemed online at time of purchase; Cannot be applied to orders after they are completed. A selection of banners are available on our AWIN profile. It’s that wonderful jolly time of the year again. To bring on some early Christmas cheer we are running this offer! Offer: 15% off Explorer 2 range. T&C's: Full priced items only. Cannot be used with any other discount codes. Must be redeemed online at time of purchase. Cannot be applied to orders after they are completed. Don't forget to replace !!!id!!! with your Affiliate ID. We have not one…not two…but THREE voucher codes for you to promote over the next 2 weeks! The more customers spend the more they can save! Terms and conditions: Basket value based on full priced items only. Discount must be redeemed at the checkout and cannot be applied once order is compete. Online orders only. 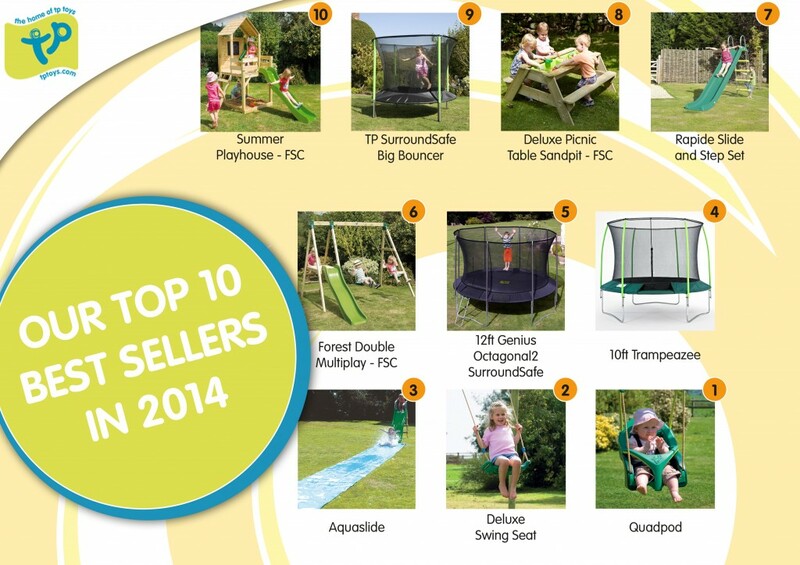 Ahead of Summer 2015, we'd like to showcase our current Top 10 performing Trampolines. 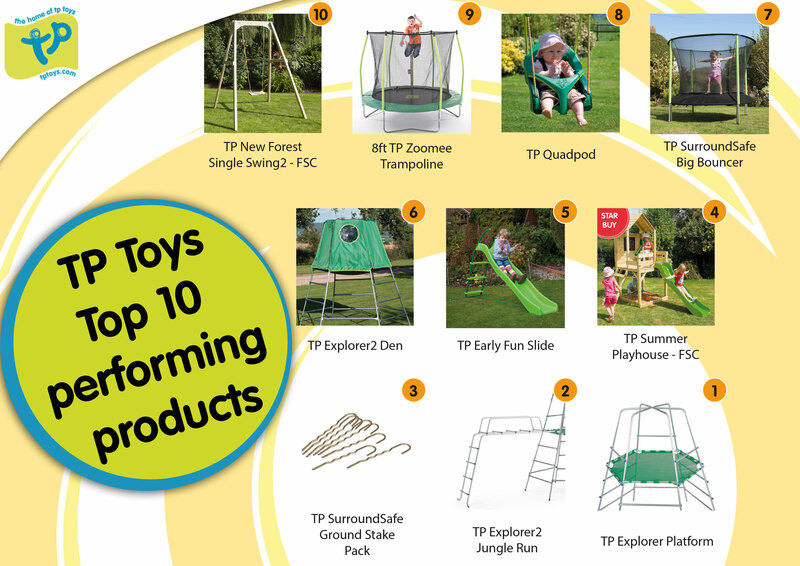 For more information about the TP Toys affiliate programme view our profile here. We have another great affiliates only offer available on tptoys.com this weekend! 15% off All Orders over £500! Until Midnight of Monday 6th June 2015, any customer who spends over £500 will receive 15% off when they enter the code AJUNE15. 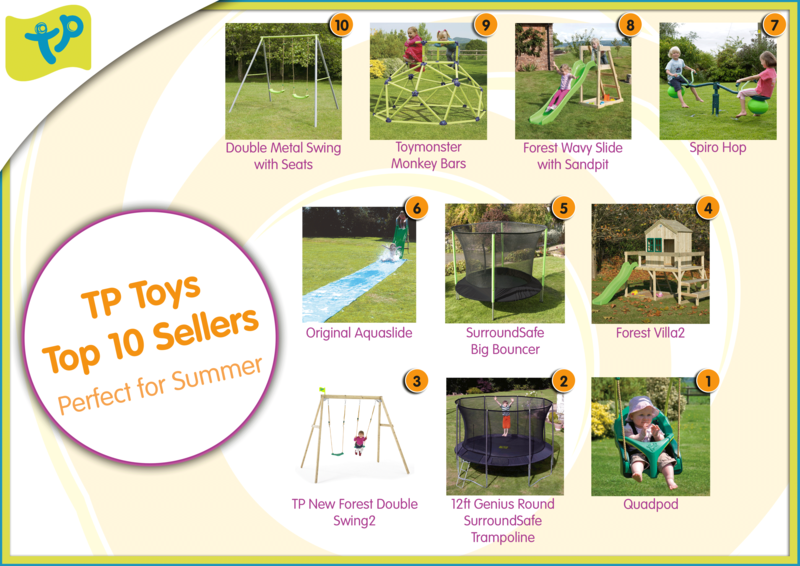 10 Top TP Toys picks for Summer! The 6 weeks holidays are nearly here! 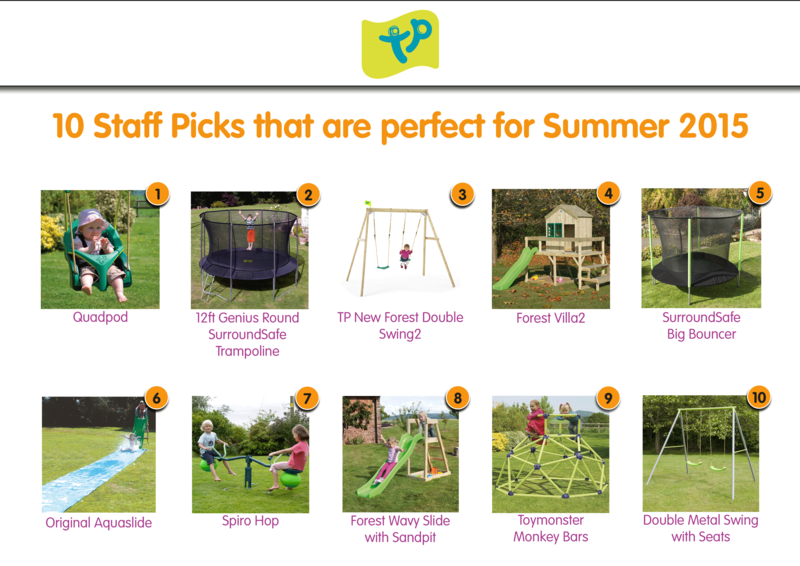 So we've picked out some great items for Summer, to keep kids active and occupied in the garden. Do let us know if you have any questions or would like to get involved in promoting exclusive offers by contacting Sarah.prestage@mookie.co.uk. We are always interested in working with our affiliates on increased exposure campaigns in return for exclusive offers/increased commission – so get in touch! 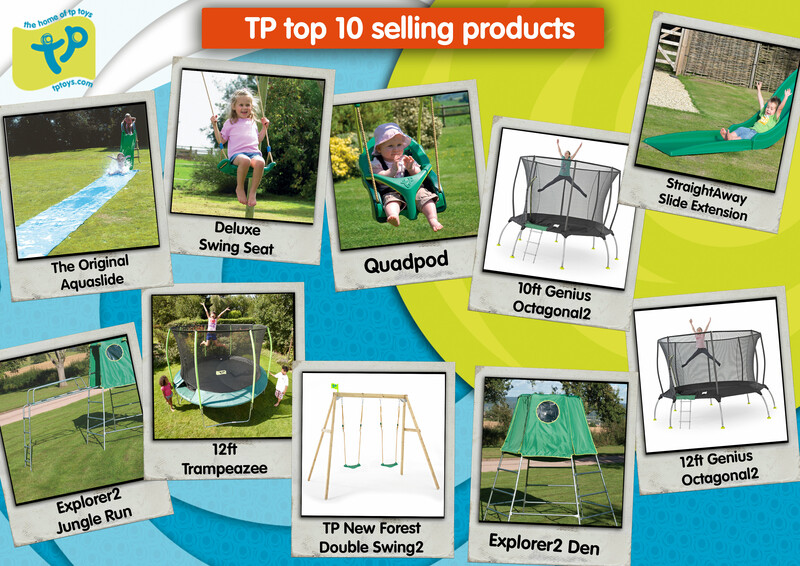 10% off all TP Trampolines! It’s nearly the bank holiday weekend and it’s half term too!! That means another offer from TP Toys! 10% off Trampoline all this week! T&C’s: Full priced items only. Cannot be used with any other discount codes. Must be redeemed online at time of purchase. Cannot be applied to orders after they are completed. We have some great affiliates only offers available on tptoys.com for the next week! Until 30th April 2015 any customer who spends over £500 will receive 15% off when they enter the code A15APR. £25 off when you buy an Acorn Swing Frame and any swing seat! Customers will receive £25 off their order if they purchase an Acorn Swing Frame plus any swing seat together and add the code ASWAPR. Offer: £25 off when you buy an Acorn Swing Frame and Swing Seat. 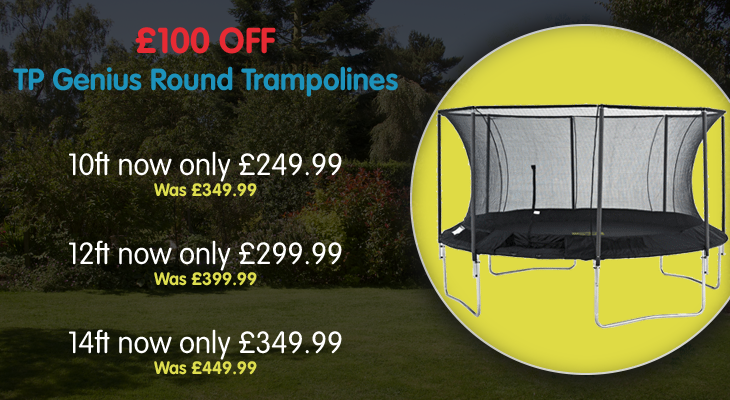 On a While Stocks Last basis, we have taken £100 off the price of 10ft, 12ft and 14ft TP Genius Round Trampolines. Terms and Conditions: Offer exists on TP Genius Round Trampolines only - sizes 10ft/12ft/14ft. While stocks last. Cannot be used with any other promotion including price match. TP Toys reserve the right to withdraw, alter, or decline this offer without prior notice. Offer must be redeemed at point of purchase online. Offer cannot be applied once the order is completed. Banners available on our [URL="https://ui.awin.com/merchant-profile/5178"]profile[/URL]. Please let us know if you have any questions or would like to get involved in promoting exclusive offers by contacting Matthew.higgins@mookie.co.uk. We are always interested in working with our affiliates on increased exposure campaigns – so get in touch! If you are not yet on our TP Toys programme with Affiliate Window, then please visit https://ui.awin.com/merchant-profile/5178 to find out more/join our programme. 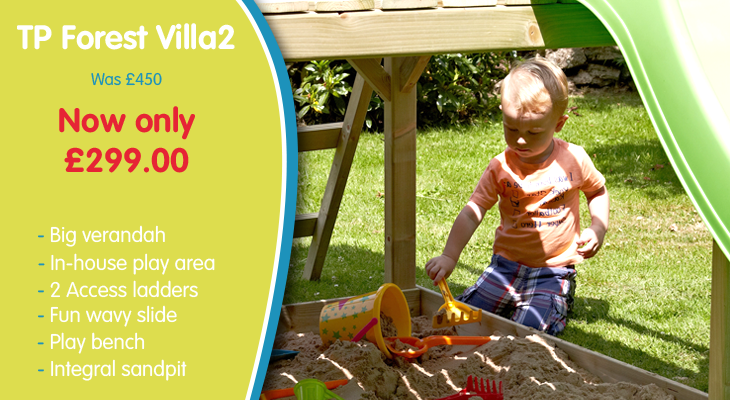 Our TP Forest Villa2 Playhouses are only £299 at the moment, and while stocks last! Down from £450. And let us know if you have any questions or would like to get involved in promoting exclusive offers by contacting Matthew.higgins@mookie.co.uk. We are always interested in working with our affiliates on increased exposure campaigns – so get in touch! We've looked into what were some of our Top Sellers in 2014, so here they are! Top 10 selling TP Toys products in October. We like to check on our Top 10 selling items on a regular basis, so here are the latest best sellers in no particular order! Do let us know if you have any questions or would like to get involved in promoting exclusive offers by contacting Matthew.higgins@mookie.co.uk. We are always interested in working with our affiliates on increased exposure campaigns – so get in touch! Top 10 Performing Products during our August Sale! 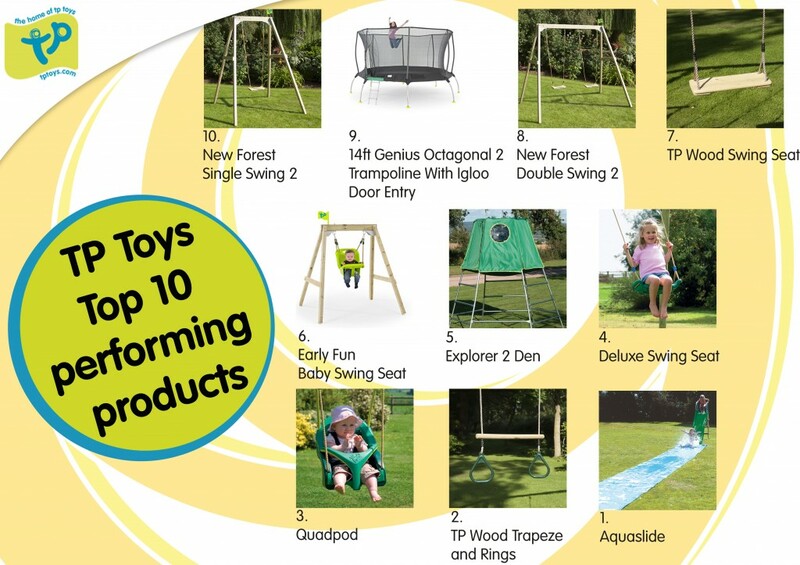 TP Toys Top 10 selling products! We like to check on our Top 10 selling items on a regular basis, so here are the latest best sellers! 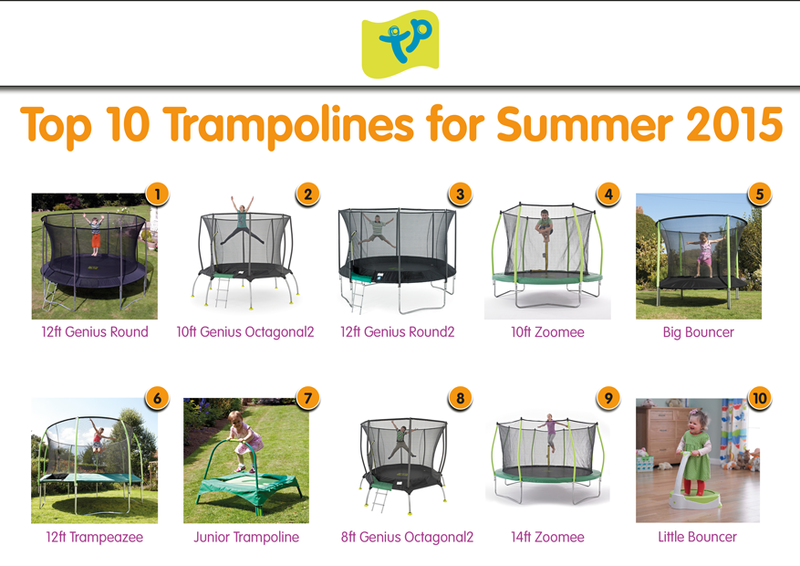 The 6 weeks holidays are nearly here, so we’ve taken 15% off all sizes of our Zoomee Trampolines here at TP Toys. This offer is still active, until midnight of 14th July 2014. Terms and Conditions: Limited lines only. While stocks last. Cannot be used with any other promotion including price match. Offer must be redeemed at point of purchase online. Offer cannot be applied once the order is completed. 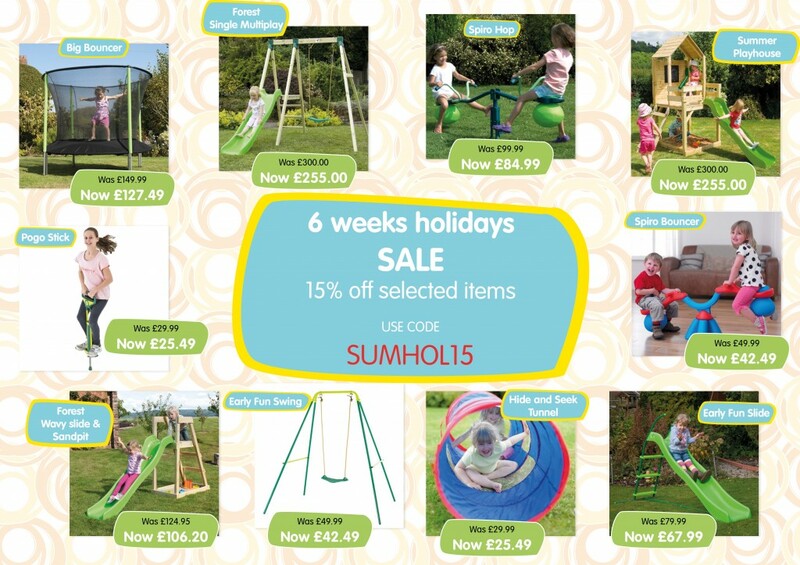 The 6 weeks holidays are nearly here, so we’re taking 15% off 10 selected items here at TP Toys. The offer will be active from today until midnight of 18th July 2014. Terms & Conditions: Limited lines only. While stocks last. Cannot be used with any other promotion including price match. Offer must be redeemed at point of purchase online. Offer cannot be applied once the order is completed. The 6 weeks holidays are nearly here, so we’re taking 15% off all sizes of our Zoomee Trampolines here at TP Toys. This offer will be active from today until midnight of 14th July 2014. Cannot be used with any other promotion including price match. Offer must be redeemed at point of purchase online. Offer cannot be applied once the order is completed. Aquaslides have been an extremely popular choice of summer treat from TP Toys! Here are the Top 10 selling items fresh from analytics! Terms & Conditions for current offers - Limited lines only. While stocks last. Cannot be used with any other promotion including price match. Offer must be redeemed at point of purchase online. Offer cannot be applied once the order is completed. 15% off TP Toys Explorer2 Frame with a Platform, Den and Jungle Run. We do love it when the sun has his hat on, so we're taking 15% off our or Explorer2 Frame with a Platform, Den and Jungle Run here at TP Toys. The offer will be active from today until 19th June 2014 and customers need to simply enter the code EXP15J at the checkout for the offer to be applied. Banners available on our profile. Terms and Conditions: Limited lines only. While stocks last. Cannot be used with any other promotion including price match. Offer must be redeemed at point of purchase online. Offer cannot be applied once the order is completed. Offer is valid on explorer 2 frame and platform, explorer 2 den and jungle run only. this offer does not include money of slides and can not be redeemed against product sets and bundles. If you are not yet on our TP Toys programme with Affiliate Window, then you can find out more/join here. 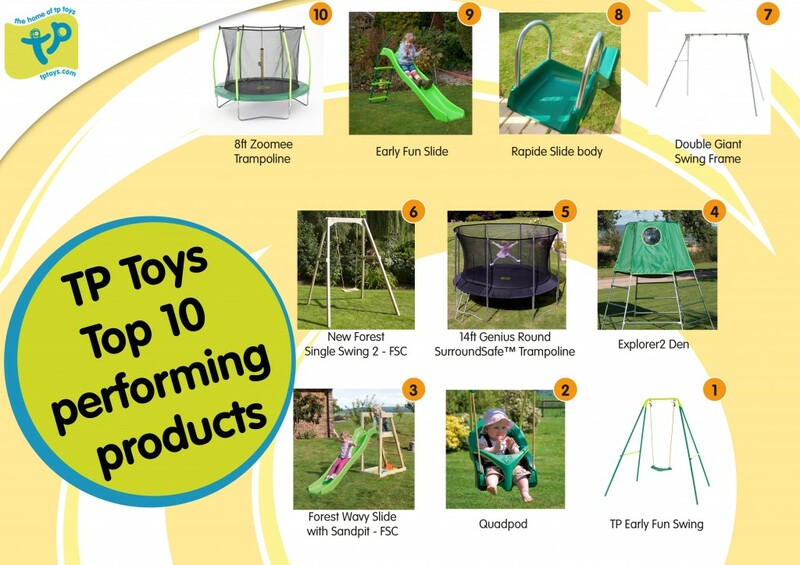 10% off TP Toys Early Fun Swings and Early Fun Slides. We’re also taking 10% off our or Early Fun Swings and Early Fun Slides here at TP Toys. The offer will be active from today until 19th June 2014 and customers need to simply enter the code EF10J at the checkout for the offer to be applied. 15% off selected Trampolines-TP Toys. We love it when the sun has his hat on, so we’re taking 15% off all sizes of our Zoomee and Trampeazee Trampolines here at TP Toys. The offer will be active from today until 1st June 2014 and customers need to simply enter the code BOUNCE15M at the checkout for the offer to be applied. The sun has got his hat on, with the weekend shaping up to be a lovely one too! 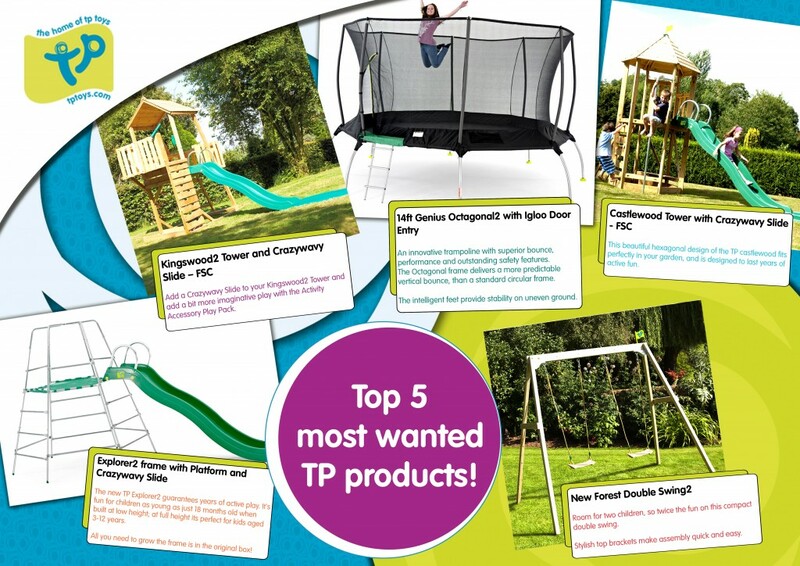 At TP Toys we’re seeing a high demand for these 5 gems that are a big hit with kids and parents, along with our Zoomee Trampolines!